The images of the new device were first published in the online forums of the Vietnamese tech website Tinhte. The device looks basically the same in design as the currently available 7-inch PlayBook, although larger in size. According to the forum poster, qung3g, the machine is also likely to support LTE 4G networking. From the pictures, the proposed PlayBook seems to have 4:3 aspect ratio, a 10-inch screen, 3G or 4G capability and a SIM card slot. It also seems to have front and rear facing cameras and an LED flash next to the camera on the back. Like its predecessor, the device looks like it is encased in black bezel matte casing. 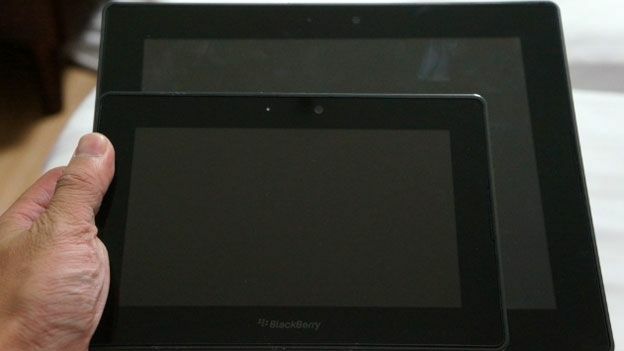 No detailed specifications about the device have been leaked, so it's unclear at this stage, whether if it will run on the current QNX OS or the announced BlackBerry 10.
if genuine, the new device could be seen as a move by Research In Motion to re-enter the competitive smart tablet market after its attempt with the first Playbook, which received lacklustre reviews. When asked for comment, RIM would not confirm whether the images were authentic. It stated instead, that it's standard policy for (the company) to decline comment on rumours and speculation. PlayBook OS 2.0 arrives, but is it a case of too little too late for RIM?